Physical fitness day is usually held in the fall, at least it always has been for Haru, that is until now. As a matter of fact, there is a national holiday in October specifically for such an event appropriately called “National Physical Fitness Day”, yet for some reason at the elementary school level, they hold in late May. And this year, it happened to be the hottest day of the year. And HOT it was ! Nearly 95 degrees on the Fahrenheit scale. And yet, someone thought it was a good day for strenuous exercise , and make little kids not only sit out in the hot blazing sun without any shade, but also run around in it too. It didn’t come without its consequences either, because MANY kids wound up in the broadcast tent and nurse’s office with various heat related ailments such as bloody noses, dehydration, heat exhaustion, etc. Haru was still able to duke it out in the unseasonably hot weather none the less, and even perform quite well. Haru’s class has been practicing for this event every since the beginning of the first grade. The one thing that she has been very proud of is the fact that she can run faster than most kids in her class. But Haru wasn’t always a fast runner. As a matter of fact, during kindergarten she was kind of slow, and ran with a very awkward form. My wife has a theory that running and training on the tumbling track in her gymnastics class has improved her running form by making her take longer strides. I kind of have to agree with this theory, because I also noticed that a lot kids in Haru’s gymnastics class have pretty good balance and running form. But unfortunately, her over confidence kind of got the best of her. During the kindergarten days, Undokai (physical fitness day) was kind of event for us. We would wake up really early in the morning, prepare lunch, head out to the venue, and line up for couple of hours -and this would happen all before 7AM. But this year, we decided that lining up at 6AM would be silly, so we decided to take it easy this year. After all, Haru school is now within walking distance and so there is no need to drive Haru to the venue. She can now just walk over there with her friends. So this year, we left at a relatively late 9AM. Of course, no “prime” spots were open. We had to set up a spot away from the grounds, but it was no big deal. Unlike the kindergarten undokai days, no one really hoarded spots near the grounds. People were pretty good about rotating in and out so that everyone got a chance to watch or photograph their kids. So in that sense, this undokai was a lot more relaxing than the kindergarten ones. Haru participated in 3 or for 4 events all together. Most were were team efforts, where the kids try to score points by beating the other team. Haru was on the yellow team which ultimately lost miserably to the red and blue teams. Then there was the 50 meter dash, which Haru seemed to be the most excited about. However, she ended up in second place out of five runners. I think she could have placed first if she hadn’t pulled a silly Usain Bolt “look over at your opponent as you cross the finish line” move, which is when the boy who was in second place for most of the 50 meter heat, overtook her and wound up winning the race. But of course, we were all proud anyway. The heat got to a searing 35.5 degrees Celsius (95+ degrees Fahrenheit) by mid day. Many kids were pouring into the broadcasting tent in droves, where the staff and school nurse sat in the shade, while the kids were made to sit out in the beaming sun without any shade at all. Many kids had bloody noses and some were on the brink of dehydration. What made me incredibly irritated is that, because it was so hot outside, they eventually opened the gym, but not for the kids but for the spectators. I took a peek into the gym and it was flooded old people either napping or sipping on tea and having a jolly good time. Really? What is the point of them even being there? If you’re not going to watch, then GO HOME! Vacate the gym and let the kids rest in there! The kids couldn’t go home so they should at least have been given some comfort in the shade. Haru’s class had a dance event after lunch. By now, the heat was insane and I really felt for the kids. The broadcast tent was too full to house any more heat stroked children, so the nurse was sending them off to the nurse’s office in the school. I was kind of hoping that they would call the event off soon, because I could see that if they continued this for much longer, it wasn’t going to end well. Someone was going to end up in the hospital. But of course, the school principal was probably watching from the window of his air conditioned office and didn’t have a clue as to how how hot it was, so the blood bath continued. Haru’s dance event was very cute and went without a hitch, or so we thought. A few minutes into the event the music skipped and eventually stopped. All eyes immediately pointed to the broadcast tent, where the guy working the CD player was frantically trying to get the machine working again. Since I was standing right by the broadcasting tent, I could see everything. After what seemed to be ages (in reality, about a 15 minute delay which is a lot in 95 degree heat), the guy working the CD player could not get it continue from the point where it started skipping and eventually stop. So the kids where called back to their seats, and MC announced that the kids would REDO THE PRESENTATION after the running events were over. Disaster! You could here the groans and complaints coming from the area where the kids were seated. I shared in their frustration and anger of over the disorganization of the event staffers. After the running events by the second grade class, Haru’s class was called up again to repeat their dance routine that was rudely interrupted by the incompetent bone head staffer operating the CD player. He eventually blamed the problem on a kid who had presumably bumped into the table causing the CD player to skip. But again, I was there…there were no kids near the CD player…way to blame the kids, staffer! Keep it classy! Haru’s group repeated their dance routine. They were very noticeably and understandably unenthusiastic the second time around. The first time around, everyone had smiles on their faces and seemed to be having fun. Whereas the second time around, they looked unhappy, bored, upset, annoyed,…get the picture. Who could blame them. It was extremely hot, and to no fault of their own, they had to repeat a dance routine because of an incompetent staffer who ultimately blamed the problem on the kids. Haru’s first physical fitness day ended without incident (at least for her), which is all I could really wish for. But just when we thought we could call it a day, pack up, and go home, the principal called out over the PA and asked the kids, the same kids who were in the broadcast tent with bloody noses and near heat stroke conditions, the same kids who had to repeat a dance routine because of staff incompetence, and then later blamed the kids for it, the same kids who had been sitting in (did I mention that it was 95+ degrees outside?) for the past 6+ hours -the principal announced that those very same kids had to clean up all of the chairs that were set up on the field and carry them into the classrooms. UGH! WHAT’S WRONG WITH THIS SCHOOL? However, in spite of it all, Haru came back in high spirits and with a very dark tan. I guess this was just all a part of physical fitness day. I am just glad that it happens only once a year. 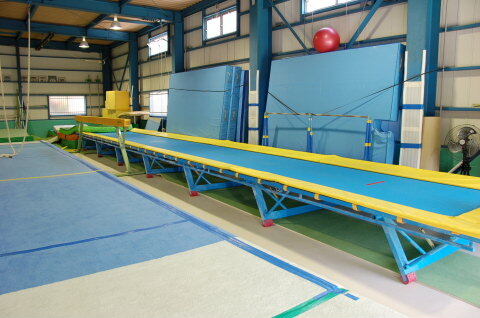 Haru started her elementary school level gymnastics classes last month. Initially, I was contemplating moving her to a different school because I was not very satisfied with the lessons she was receiving from her current school. There were a quite a few unruly kids whose seemingly only purpose for being there is so that their parent(s) can get an hour to themselves to text message or play games on their phones. They obviously didn’t care whether their child can do a round off or cartwheel, but rather how good the signal quality in the gym was. Personally, although it was admittedly annoying to see these parent(s) more engulfed in what was being displayed on their phones rather than what their own kid was doing, I didn’t care too much about what they did. For each is own. However, I get thoroughly annoyed when these disruptive kids take up valuable lesson time from the other kids when the teacher has to chase them around the gym, or when they are assigned a private instructor (which isn’t free according to their own homepage) for free, and to just make sure that they don’t run around and climb on the equipment. It takes away so much from the kids who genuinely want to learn and become good at what they do. I thought that moving up into the elementary school level classes would change all this, and for the most part it has changed somewhat. Since this class goes from first grade all the way up the sixth grade, I figured that there would be some kids who would be really good -I mean near competition level good, but unfortunately the older kids aren’t that much better than Haru. As a matter of fact, in a matter of a few weeks, she has pretty much come very close to what the sixth graders are doing, and to some respect, she can do more than they can do. Normally, Haru should be in the first grade group, but she is in the second grade group, and she still out performs everyone in her group. The next level is the third grade and up group, but since the kids are physically so much bigger than Haru, I think the instructors are reluctant in advancing her up another age group. So for now, I am just going to wait it out…after all, it’s only been a month. Every third Sunday of the month, Haru’s cheerleading class holds a special tumbling class for girls who want to improve their tumbling skills. The tumbling coach is really good and pretty much taught Haru all of her tumbling moves. This coach also has his own tumbling classes on Monday evenings. Haru has been wanting to go to his tumbling class, but it had been full for a long time, plus its held pretty late in the evenings, so my wife would have had a hard time taking her. This month, some students advanced up into the advanced classes, leaving a couple of openings in the classes. I thought this would be a really good opportunity for Haru to advanced her skills and give her a better chance to finally overtake even the older kids and move up in her gymnastics class. Since my work schedule is pretty flexible, I am able to come home fairly early now and take Haru to the tumbling classes, so it was a done deal. We signed Haru up for tumbling classes once a week every Monday. The only drawback is that parents are allowed to watch only on the fourth Monday of the month, which I thought was a strange policy, but its perfect because my gym is only two blocks away. This gives me an opportunity to workout and get free parking (since free parking comes with gym membership), while Haru does tumbling. Its a win-win for everyone! This is a video of what Haru was doing in class. She was the only one in her gym class to be able to do this. In contrast, almost everyone in her tumbling class can do this. Although still not perfect, she is improving everyday.